and there are always plenty of activities to take part in centred around informal groups within the club. Although we focus more on enjoyment than speed, some of our rides do need good levels of stamina and fitness. New riders are always very welcome. All we ask is that if you enjoy your riding with us, you join the CTC after three rides. form the ‘core’ of our local riding. Normally, each Sunday, 'A' and 'B' rides start at 10.00 am from designated points shown on the programme. 'A’ rides are longer and faster than 'B’ rides. 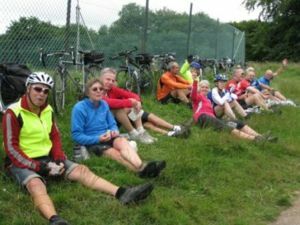 CTC Exeter, and members, also organise informal events, and take part in mountain biking, weekend trips, audaxes, and competitions. So, there is usually a Tuesday Micro Bike Bus©. 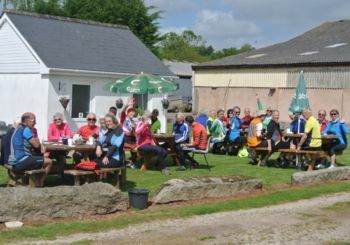 These are weekly rides from Exeter, typically 60-100 miles long, which often meet up with other local cycling clubs (see below) for coffee. 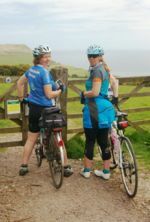 There is no advanced published programme, but Richard sends out a weekly email, normally on a Saturday, giving details of the following Tuesday's ride. The Micro Bike Bus© 'driver' leads a planned route to a coffee venue and thence to a lunch destination. If you would like to be included in Richard’s weekly email, why not drop him a line at cholladua(at)gmail.com. We want our rides to be as safe as possible, so have some guidelines called "Our Group Riding Guidance & Principles" which you can view here, and "Group Riding – Our ‘Shouts & Signals" which you can also view here. Please take the time to get to know these and use them on our rides. From time to time, We organise training in bike handling, road-craft, first aid, and bike maintenance. We want to encourage riders of all skill levels to participate in these activities - just remember - novice riders haven't practiced in bad habits, so experienced riders have much to gain, too! Just ask ! We have an information sheet for new riders which can be found here. We also have a 'Buddy' system, and a Bike Bus to help introduce new riders to our activities. Your bike is likely to be suitable initially,as long as it has some low gears and is well maintained. Similarly, your fitness will improve as you do more cycling, and we ride many routes which are suitable for cycling 'newbies'. CTC Devon publishes the 'Highwayman' magazine about monthly which contains reports of local and foreign rides plus information on upcoming rides and activities. More information here. Please send in your photos from recent rides. If your interest also covers racing, some good local clubs are:	Exeter Wheelers (Exeter), Sid Valley Cycle Club (Sidmouth & East Devon), CS Dynamo (Exmouth) and	Mid Devon Cycling Club (South Hams, Teignbridge and Torbay). National Contact: Cycling UK, Parklands, Railton Road, Guildford, GU2 9JX. Telephone 0844 736 8450 or 01483 238 337 (local rate)	Website: www.cyclinguk.org. Local Contact: If you'd like more information please contact our Secretary, Lyndsay Kyrke-Smith, Telephone: 01392 469838 email lyndsaykyrkesmith@gmail.com. This page was last edited on 4 January 2019, at 16:21.